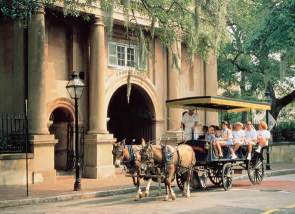 The Charleston Peninsula is the heart of the city. Also referred to as downtown Charleston, this is where you'll find most of the shopping, restaurants, museums, music and theater venues, historic sites, and tourist attractions. In a city that dates back more than 300 years, buyers are not merely purchasing a home, but a piece of Charleston's rich history as well. Downtown Charleston Real estate is ideal for buyers wanting to live within walking or biking distance to shops and entertainment, buyers looking for historic homes, and buyers wanting the prestige that comes with this notoriously upscale real estate of downtown Charleston. Downtown offers a dizzying array of homes for sale, from massive antebellum houses to newer high rise condos. Prices are often viewed on a sliding scale from the Battery section of the peninsula, where the breathtaking, meticulously restored colonial homes begin in the multi million dollar range, to the modest shotgun style homes in the northwest portion of the peninsula near the Crosstown, where prices are much lower. Downtown Charleston is the most sought after area for real estate in all of tri-county Charleston because it has the sites and attractions that Charleston is famous for. You should be able to find everything you could possibly need without ever having to leave the peninsula - from everyday groceries to holiday shopping to priceless antiques. The only exception is the beach, which isn't far away. Within a 15-20 minute drive, you can reach 4 of Charleston's 6 beaches. Folly is to the south, and to the north you'll find Isle of Palms, Sullivan's Island, and the private Wild Dunes Resort. The Battery is the southernmost section of the Charleston Peninsula, and this area is perhaps the most photographed in all of Charleston. Battery park (also called White Point Gardens) was opened in 1837 and is a popular setting for weddings because of its winding old live oaks and its incredible views of the harbor. 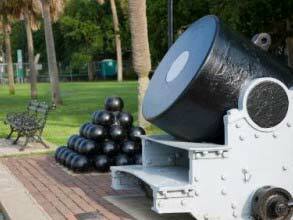 Its location made it an important fortification during the Civil War, and you can see many the original cannons that have been preserved for about a hundred and fifty years. Some of the city's most impressive homes are located around the Battery, and you'll see the best views of the Charleston Harbor from the raised walkway along East Battery Street. Continue along this street until it turns into East Bay. You'll pass the famously colorful Rainbow Row townhouses. Take a right at Queen Street, and follow it to waterfront park at the end. This is a great place to sit and watch barges come in and out of the Charleston Harbor. Continue along East Bay Street until you get to Market Street, where you'll find local vendors selling everything from jewelry to Charleston cookbooks and t-shirts. This is a great place to see Charleston's sweetgrass baskets, since there are always several basket weavers among the vendors. Grab an ice cream at Ben and Jerry's, or continue through the market vendors until you reach the Market Hall building (pictured). This circa 1841 Roman Revival style building was built to indicate the meat market section of downtown (you'll notice sheep and bull images in the stucco frieze of this building). The market dates further back than Market Hall, though. The Pinckney family donated the land for the market in 1788, when this section first began selling produce, fish, and beef. When you're done shopping at the Market, cross over Meeting Street and either head straight on up to King Street or cut through the Charleston Place Hotel. 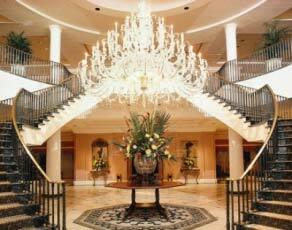 This is one of the nicest hotels in all of Charleston. The hotel boasts over 40,000 sq ft of meeting space for conferences (including 2 ballrooms often used for weddings), a spa and health club, and a rooftop pool. On the hotel's first floor you'll find a very nice restaurant (the Charleston Grill) and several luxury shops, including Louis Vuitton and Gucci. When Charleston was voted among the Best Shopping Districts this past year, it was specifically the shopping on King Street that won recognition. You'll find everything from antique shops to boutiques - not to mention big chain stores like Pottery Barn, Banana Republic, J. Crew, Ann Taylor, and Talbots, just to name a few. There are also plenty of good places to grab a snack or lunch, from Starbucks to Kickin' Chicken to Jim 'N Nick's BBQ. King Street is not only popular for its fantastic shops and restaurants, but also for the great mix of new and old building styles. This commercial district has tastefully updated the buildings to fit today's needs while preserving Charleston's rich history in its architecture. 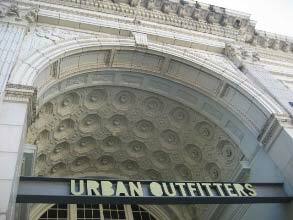 You'll see this mix both in the storefronts and the interiors (the best example is probably Urban Outfitters, pictured above). Another good example is the Apple store with its modern glass exterior nestled among the classic Charleston storefronts. On Saturday mornings you can check out the Charleston Farmers Market. Although you'll find several farmers markets throughout Charleston, the one at Marion Square is the main one for the tri-county area - and it's one of the largest farmers markets in the state. This is a great place to get fresh, local produce and cut flowers. You can grab breakfast or lunch at one of the vendors (our favorite is probably the Big Fat Greek Tent, but there are so many good options! ), or see the many vendors displaying jewelry, pottery, pet accessories, art work, and homemade jams. The farmers market usually runs 8 AM to 2 PM every Saturday from April to December. It's located in front of the Francis Marion Hotel (pictured at right) at the intersection of King and Calhoun Streets. Most buyers looking for Downtown Charleston real estate want to live as close to King Street as possible so they can walk to the many shops, restaurants, and entertainment options in this hub of the city. The high demand for this trendy lifestyle continues to raise prices for the homes for sale near King Street. 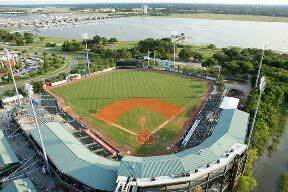 Charleston's minor league baseball team, the Riverdogs, has its home stadium in downtown Charleston. The season usually runs from April to September, and ticket prices are quite reasonable for a night's worth of leisure. Bill Murray is a Co-Owner and also serves as the Director of Fun (yes, this is an actual title) - so this may be partly why the mascots and the audience games between innings are highly entertaining. The South Carolina Aquarium is also extremely popular among both locals and tourists. It's located directly on the Charleston Harbor, so it has fantastic views as well as thousands of marine animals to see inside the building. This is a very kid-friendly place to visit, and it's a great educational experience for both kids and adults. Some of the animals you'll see include penguins, sharks, loggerhead turtles, seahorses, and otters. The aquarium has various exhibits throughout the year, so be sure to check their website when you plan your trip! Charleston is a city known for its cuisine. You'll find great local eateries to satisfy a wide range of palettes, from French to Thai to good Southern home cooking. You could dedicate an entire website to good restaurants in downtown Charleston, but here are some of our favorites: Slightly North of Broad, Rue de Jean, Basil Thai Restaurant, Oak Steakhouse, Husk, Anson, Gaulart et Maliclet Café (more commonly known as Fast and French), and High Cotton. You'll also find some tasty local chains that are more affordable, like Jim 'N Nick's BBQ, Andolini's Pizza, and the Kickin' Chicken. We'd also recommend Fleet Landing, which has some of the best seafood and waterfront views in all of Charleston. You'll find that the prices are quite reasonable for seafood, and you can choose indoor or outdoor seating. 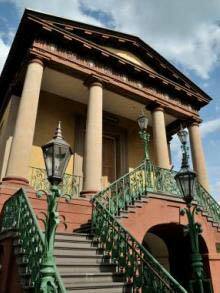 Founded in 1770, the College of Charleston is one of the most popular schools to attend in South Carolina because of its location in historic downtown Charleston and also its close proximity to the beaches. 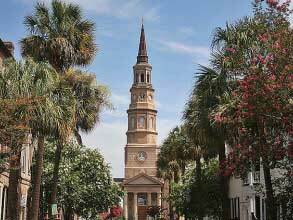 In fact, you'll find that many Charleston residents went to the College of Charleston, fell in love with the city, and remained in Charleston after graduating. 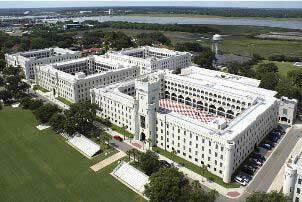 The Citadel, also called the Military College of South Carolina, is a small college dedicated to its long held traditions of discipline, leadership, and military training. About a third of its graduates go own to start careers in the military. The Citadel is often recognized from Pat Conroy's novel The Lords of Discipline, since Conroy himself is a graduate of the institution. For college sports fans, you'll find plenty of games to attend between the Citadel and the College of Charleston. The Medical University of South Carolina (usually referred to as MUSC) is one of the five biggest employers in the Charleston area. MUSC is partly to thank for Charleston's good healthcare system. People come from around the state to see its specialists, and you'll find a hospital and quite a few doctors' offices affiliated with MUSC. 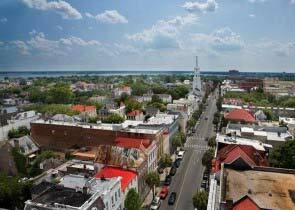 Condos are the most affordable way to buy real estate in downtown Charleston. Also, because condos tend to have a better location for the price compared to houses, you'll find a good selection of condos that are within walking distance to the shops and restaurants downtown. To get in a good location downtown, you'll find condos starting in the mid $300s. These will be mostly be condos with 1 bedroom, 1 bath, and anywhere from 500 to 1,000 sq ft. Condo prices go up to almost $5 million for waterfront condos in the historic district of downtown Charleston. 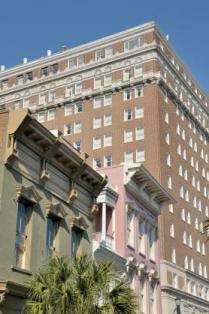 Downtown Charleston has several large condo buildings, like The People's Building (above you'll see the view from a condo in this building). More options include Vendue Range, the high rises at 1 King Street (also with great water views), Dockside, the Bristol, Laurens Place, Ashley House (which has some of the most affordable condos in this list), and Bee Street Lofts (which has some of the newest condos in downtown Charleston). The condos, especially near the tops of these buildings, have incredible views of the city and the Charleston Harbor. If you don't want to live in a big condo building and you prefer a more historic feel, you may like the houses in downtown Charleston that have been subdivided into condos. These sometimes have a different layout than traditional condos simply because they were not originally built to be condos. They're still very functional, though. Buyers often prefer these types of condos since they have more of the Charleston feel. These condos make up the majority of condo listings in downtown Charleston simply because so many houses have been converted to condos. This is a great option for living in a historic Charleston home without having to pay a high price to own the entire home. You'll find these kinds of converted condos throughout the Charleston Peninsula. However, the most popular condos tend to be in historic neighborhoods like Harleston Village, South of Broad, the French Quarter, Cannonborough, Elliotborough, and Radcliffborough. You'll also find quite a few condos around Colony Lake.